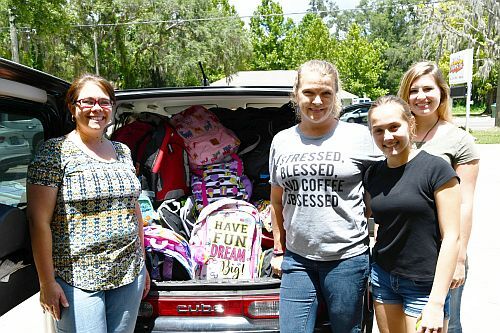 WHIF/Palatka (Hope FM) had a tremendous response from their listeners with their annual school supply drive. They collected enough to stuff 450 backpacks with supplies for local students, (the goal was only 300!) then delivered them to schools to distribute to children that start school without anything. They also raised enough money to equip each elementary school clinic with a supply of socks and underwear for little ones that have accidents during the day. Pictured Station Manager Robin Robinson, Office Manager Kristi Hill, student volunteer Zoe Brown, and Production Director Shayna Keller load up the “hopemobile” to deliver school supplies to one of their local schools.